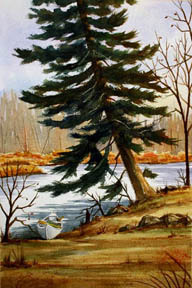 This scene was created from a photo I had taken while canoeing on the Snake River in Northern Minnesota. A friend and I were paddling down the river on a late spring day and pulled to the shore to rest and have some lunch. I created this 6x9 color sketch first to get an idea of how I would approach the painting and plan the composition. I sketched the scene onto a piece of half-sheet 140lb Arches cold-press paper, soaked it in water and then mounted in my stretcher. With the paper dried and stretched, I began by laying down the sky wet-in-wet using cobalt blue, cerulean, permanent rose and raw sienna. 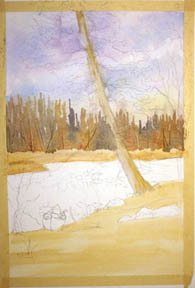 The background trees were put in while the sky was still damp, using winsor blue, burnt sienna, light red and a little sap green. I scraped a few tree shapes into the tree line while the paint was damp. The distant shore and foreground were added with a quick application of raw sienna for an under-painting tone. I put in the shadows in the water using cobalt blue and permanent rose. 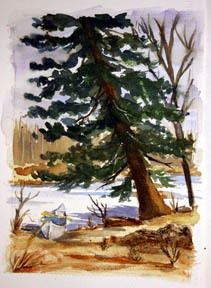 I defined the shape of the canoe and put in some darker areas of foliage in the distant shore and some rocks and shadow areas of the foreground using burnt sienna, winsor blue, light red and sap green. I scraped some highlight shapes into the rocks while they were still damp. I added some color to define where the main tree shape would be. 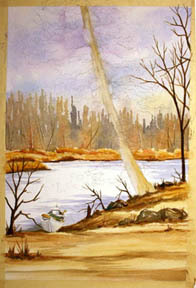 Next I added the foreground trees and some weeds using a darker mixture of burnt sienna, winsor blue and light red. 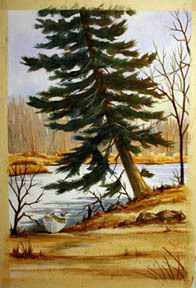 The main pine tree was added using a rich mixture of burnt sienna, winsor blue and sap green. I let the pigment mix on the paper, charging in lights and darks where it seemed fit. I scraped in some bare branches before the paint dried. 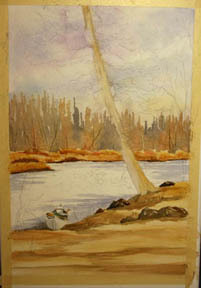 I added a few more weeds and grasses to the foreground and darkened the shadows around the canoe. After letting the painting sit for a day, I came back to it to determine what else it might need to finish it. I darkened the water shadows and added some leaves to the trees. I also added some more light red and burnt sienna accents to the distant shore. In the foreground, I added more texture and color with quick brush strokes of cobalt blue, sap green and burnt sienna. I splattered some light red and burnt sienna over the area to add some texture and color balance. At this point I think it's done!